Letting our business revamp your vehicle's exterior and parts means a couple of things. You get to work with a team that gives your car the proper attention it deserves. You can ensure that its fits and finishes are high-quality improvements, and you can work with a company that has built award-winning cars multiple times — many in which have been featured in shows. Find out more about our services. Snyder Street Rods is a Hastings, Nebraska-based business that puts prime emphasis on quality workmanship and detailed custom finishes. We are a small, in-house shop with the ability to individualize every car that comes in and do car metal fabrication, custom painting, performance upgrades, and more. We have been in business for more than 10 years, and our team as a whole has more than 25 years of experience. The owner of our Hastings, Nebraska company has always done bodywork and custom car work. He got busier and busier with custom work and started our business. Get show car quality services from our in-house auto shop. 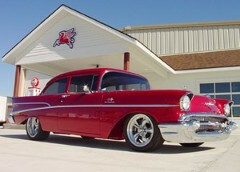 Welcome to Snyder Street Rods, an award-winning leader in complete rebuilds and restorations. Based in Hastings, Nebraska, Snyder Street Rods serves clients all over the United States. Since it's founding in 2002, Snyder has earned a reputation for precise craftsmanship and flawless finishing. The numerous national and local high-profile awards speak for themselves.